In the last weeks both Jonathan Miller (on Curbed) and Urban Digs reported and provided data to support what buyers and sellers alike are finding in the Manhattan luxury condo and luxury loft market; inventory is at seven-year lows and competition among buyers for new apartments that hit the market is super high. Multiple bids are back, especially in the $2-5 Million price point, and buyers in areas like Tribeca, Greenwich Village, the West Village and on the Upper West Side are feeling the heat. While the entry level market is very competitive downtown, pricing still needs to be on-target otherwise buyers are moving onto the next best property. 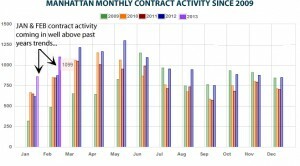 Check out these graphs created by Jonathan of Miller Samuel and Noah of Urban Digs. They say a picture is worth a thousand words. These graphs take things from ‘broker-speak’ to reality. What is real estate? As I leave my office late tonight, I look at the list on my desk-wall of clients who want to buy or sell. They aren’t numbers to me. They are people: fathers, mothers, children, partners. All with a dream of owning a home or having more space. A place to create memories, to celebrate anniversaries, to laugh, to cry, to perhaps disagree and then come back together. To watch teeth fall and then the 1st sideburns grow. Downtown 3-bedroom properties that have gone to contract since December 20th, 2011, have done so in approximately 45 days after coming on the market, according to a quick (and unscientific) study I did today. It validates what I and other brokers are feeling in the Downtown 3-bedroom market right now. Buyer interest, appointments and open house visits are up. The best inventory is moving quickly and even some properties which are not considered ‘the best’ are selling if their price is reflective of condition. Areas like Nolita, Bowery, Tribeca and Soho continue to see growing interest from buyers who need space and wish to live in vibrant neighborhoods. Thirty years ago there was a reason to leave the city – safety, school, neighbhorhood. Today Manhattan offers all of that and more. Ask anyone who’s got two or three children under seven in Manhattan. If they can figure out how to make it work numbers and space wise, they’d rather stay here. Perhaps because it provides a more dynamic lifestyle for both parents and children than the suburbs? Your call. But I see demand for 3 and 4 bedrooms remaining solid right now. Even the larger two bedroom market is seeing a bump. A new loft I listed at 195 Bowery in Nolita/Lower East Side had twenty people at its first open house. If you have any questions on the Manhattan market or are looking to make a move, feel free to contact me. Why Are 3+ Bedroom Tribeca Lofts in Such Demand? Walking in Tribeca today on N. Moore Street, I noticed this scene outside the Montessori School and it made me smile. 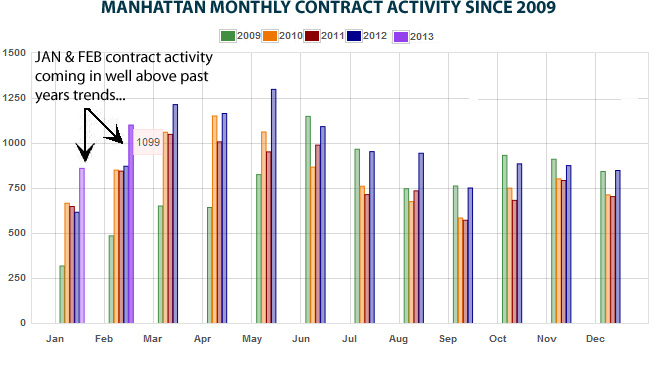 Then I thought, is this a big reason why 3-bedroom Tribeca lofts have been in such demand for the last 18 months?